Your Daily Cute: Meet Florence and Herman! We have two new members of the Cute family! No, I didn't adopt any more cats, but I am kind of a new mommy (and hopefully soon a grandma!). You see, one day a week or so ago, Florence and Herman showed up. At first, I thought they were just coming to visit -- but then I realized they were totally setting up camp and making a home! Florence is a sweet little dove that has made her nest on top of my hurricane shutters on my balcony! I have no idea why she chose my balcony, except that of course she did. I am Mother Nature. Animals flock to me. It never fails. Florence has a husband. His name is Herman. 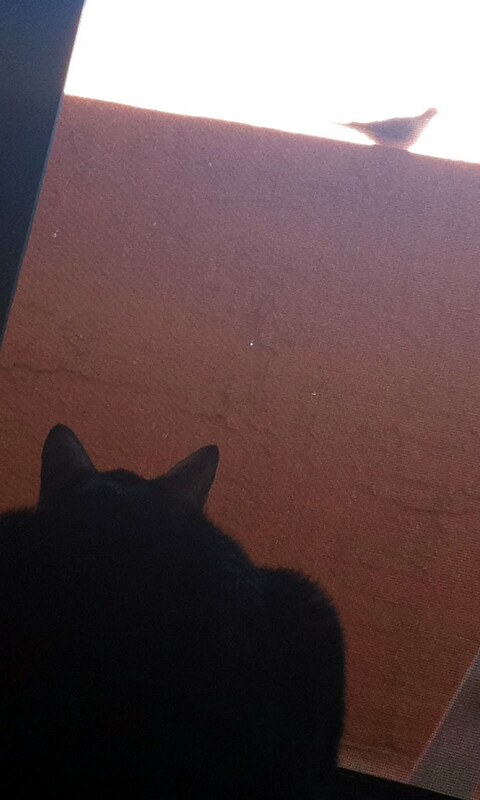 Herman likes to keep an eye on Florence from the rooftop of the balcony next door. He is always in the area, making sure she's OK. When they were first building their nest, they used to both hang out up there -- scoping out a good nest spot, I guess -- but now that Florence is roosting, Herman hangs out by himself. 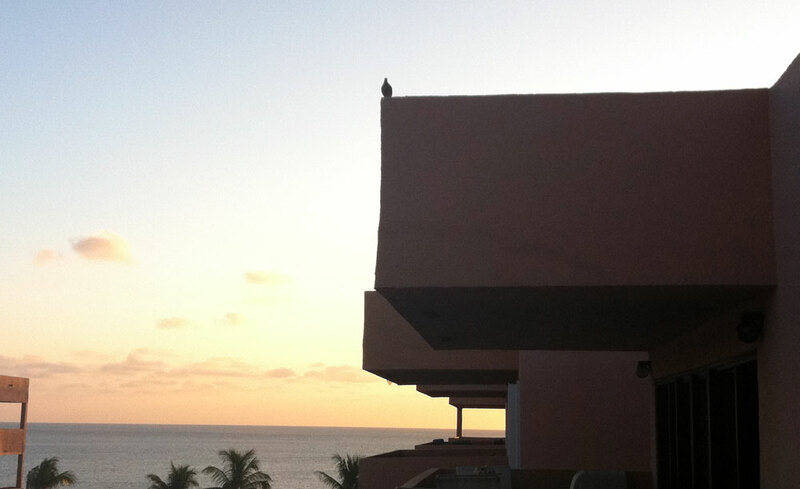 Sometimes he comes over and watches from closer -- on the rail of our balcony! This is prime birdie-watching position for Pimp. Don't worry, though, Herman is safe. Pimp only watches from inside and chatters at Herman. He's harmless. I am so excited about this, Cuteheads! I can't wait to have baby birdies out there cheeping away and providing Pimp and Moo with some quality bird-watching. Every morning, one of the first things I do is go out there and say hi to Florence. And when I get home from work, I check on her, too. I'll keep you all updated and hopefully have baby pictures to share soon! I'm going to be a very proud grandma. Does anyone know how it takes for birds to lay eggs and then how long it takes for them to hatch? Share if you do! Om nom nom? Just a little? Around the tail feathers? (licking my lips) yummmm. We has lots of birdies here too, but they are safe from me cuz I'm indoors unless M is outside with me and I'm in my harness and leash. I had Mourning Doves make a next on our balcony for about 3 years in a row...I nicknamed the Mom "Birdie Girl"....it was soooo much fun to watch! 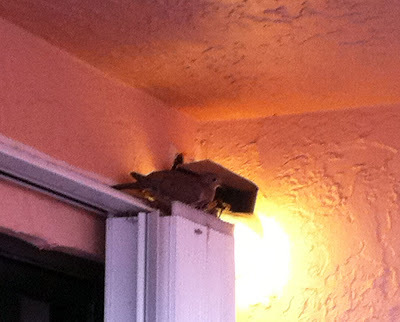 A dove nested on my balcony twice -- and she raised her babies -- in a big planter. Through snow and ice she kept her nesting vigil - after about 2 or 3 months, everyone was ready to fly away. Cute birdies!!!! I just googled about doves. It said once the eggs are laid, it takes about 18 days for the eggs to hatch. Can't wait to see the baby birdies! pimp and Moo will have some great bird t.v. to watch!!! It's gonna go FAST! Being that she built the nest and is hanging out there, I'm gonna say you'll have eggs any day. The babies will grow up in a couple of weeks and be gone like THAT! Awww! Pimp and Moo have a great CatTV channel! I rescued a mourning dove with a broken wing a few years ago. Kept it in a cage until it's wing healed and then we released it. Can they come to our house next? So sweet!!!! I like that they are a couple! Also "chatter" is a GREAT word to describe the sound the kitties make when they see birds! OMC! So cute and so close dat I is jealous. We sometimes gets birdies on our balcony out momma and daddy's bedroom and I gets up on my back legs to watch between da blinds and glass MOL. Can't wait till dere are babies! You scared me there for a minute....I don't remember seeing a photo of you with anything but a flat stomach!! I think on a norm it's around 21 days but I really could be wrong as I've not had a pleasure of watching.